Another little understood culture inhabited Jackson County, Indiana. They left behind extensive mound structures surrounded by an immense leveled plain, but they didn't bury their dead in the mounds, nor did they place artifacts in them. For the last century and a half professional archaeologists have declared the mounds to be natural in origin, not manmade, because there are neither remains nor artifacts in the mounds (typical of Woodland Indians they know about). 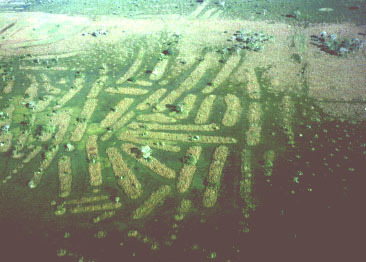 The Jackson county culture is very similar to one of the earliest found on the Peruvian Pacific coast which also built mounds without artifacts or human remains in them. That culture also created an immense level plain in their settlement area. Here an archaeologist has evidence of a third culture that built mounds (with some artifacts), as well as large level plains around them. The mounds in Jackson County (mostly in and around Seymour, Indiana) were not "piled up" with thousands of baskets of dirt and sand. Rather, they look more like mounds "left behind" as the plain around them was flattened. Just West of Seymour is a Council Circle used by American Indians. During the period of white expansion this circle served to provide the delineation of what's called the Ten O'Clock Line to the NW, and another survey line to the NE. These lines themselves parallel the Southernmost lines of a piece of astro-archaeology near Anderson, Indiana where paleo-Indians had constructed a series of mounds that mimic the Big Dipper constellation. Those mounds have no buried artifacts in them either, although there are other mounds in the area that do ~ those with astronimical significance are empty of identity! We don't really know who built them. I'd say this guy is on the right track once he starts identifying mounds and raised bed structures with astronomical significance. At the same time "I" will be on an even bigger track having noted the similarities of two paleo-cultures 5,000+ miles apart! HISTORIC NOTE: Freeman Field at Seymour was built right on this same level plain for use as a base for the Black Air Force of WWII. Our technology progresses, while the societal conditions which make it possible, 'digress' (ungress? :^). At some point, the structure fails catastrophically, and weeds grow over the interstates. Words are fine, but if we don't get pictures in this Internet thing, we will file all this in the same drawer with Hoagland's Martian stuff. I've read a little about the mounds you describe. I don't think they are the same as 'raised-beds.' The mounds you describe are much larger and taller. 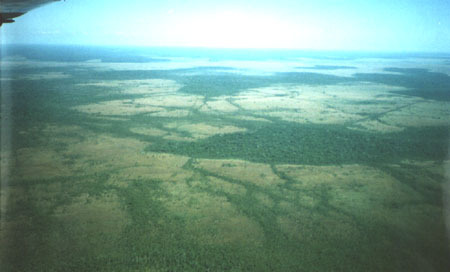 The Seymour mounds are about the same height as the Anderson mounds that have astronomical significance. 15 feet is typical; there are some taller ones about 20 feet high. Adena and Hopewell structures are far larger, made of earth, and ordinarily have human remains and artifacts buried in them. "Adena and Hopewell structures are far larger, made of earth, and ordinarily have human remains and artifacts buried in them." These are the ones I was referring to. BTW, do you know who were the Adena? Have you read the stories about giant skeletons (with double rows of teeth) that the early settlers claim to have found in the region? Interesting, but I'd like to see some data that these conclusions are based upon. Thanks for the link, I'd forgotten that one. Here is a collection of images relating to the recent article by Dr. Clark Erickson on fishweirs in the Bolivian Amazon. Click each thumbnail to view an larger version. All photos are available in high-resolution versions (approximately 1980 x1340 pixels). Email Clark Erickson at cerickso@sas.upenn.edu for details. All images, figures, and related information are the property of Clark Erickson. ©2000 Clark L. Erickson. very cool pictures. Thanks for the addition. 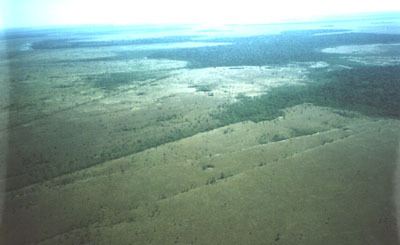 Prehispanic raised fields in the savannas of the Llanos de Moxos of Bolivia. The elevated planting platforms are 20 meters wide, 0.2-1 meter tall, and up to 600 meters long. Thank you for posting this very interesting article. b. Hey RightWhale, we have (more than words) pictures.